In case you have been living on another planet, Best buy is rearranging the way in which they buy and stock anime DVDs. To keep a long story short, about 400 Best Buy store are clearancing much anime for 1/2 price through March. Run down to your local BB and see if yours is on the list and score some cheap anime. 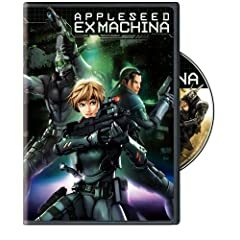 One that I picked up was Appleseed: Ex Machina. This is the newest version of Shirow’s classic story of utopia with a dark secret. John Woo directed this version so expect the dramatic slow-mo action and baletic gun play Woo is known for. One thing to not expect is decent CG. What is up with Duenan’s hair? it looks like she got shingles on her head. Ugh. Bodies that seem stiff and joints that don’t move. Atrocious at times the best blend seemed to be the almost cell animation look they were using for the flashback sequences. Wish they had used that look more. The final battle sceen has a fight with aerial drones that is a nod to the spectacular fight scene in the final Matrix movie. The story is good and not a straightforward retelling of the Appleseed story, it has enough to be fresh and the story fits with Woo’s style of storytelling. This is my favorite version of the Appleseed story, just wish the CG had been better.